Ruche: Sunlit Serenity Giveaway: Part Two! 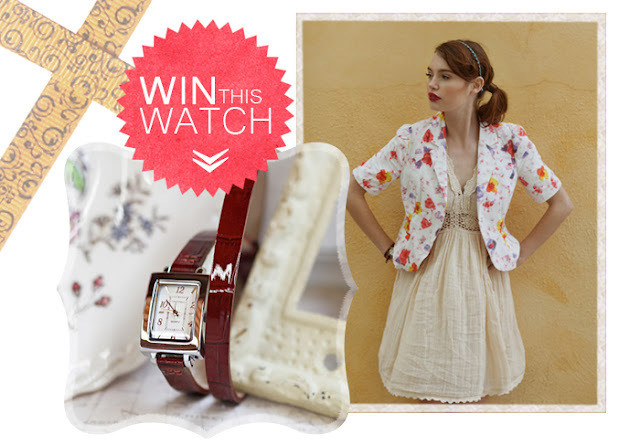 Love our monte carlo double wrap watch by Tokyo Bay? Share the Sunlit Serenity lookbook for your chance to win it! Share the lookbook photos and link back to our lookbook on your blog, Twitter, or other social networking page. You must give us the link to your post in your comment below. Embed the lookbook into your blog, Twitter, or other social networking page. You must give us the link to the post in your comment below. For the embedding code, go to http://issuu.com/shopruche/docs/sunlitserenity and click on "< > get embed code"
CONGRATULATIONS, KATHLEEN FRANK! Thank you so much for tweeting the lookbook! We will use randomizer.org to find the winner. No purchase necessary. We reserve the right to close the contests early or late without warning. We will post the name of the winner June 17, 2011. Upon winning, you agree that your name can be published on this blog at the close of the contest. You must contact us within 7 days after the winner has been announced to claim your prize. And I may said I love all the pieces of clothes in the lookbook they are amazing!!! I posted the link and some pictures on my blog! Opps. Just saw that we could post each link as a separate post. So here is the one I did for twitter. I wrote a little blog post about your enchanting lookbook. Here's the link on my twitter. Enjoy. I wrote a little blog post about your enchanting lookbook, and then I posted a link on my twitter page, and my facebook page. Enjoy. Sorry about that!! I'm not really sure how to delete my previous post.. I tweeted away -- I honestly love the lookbook! i also posted this on my Tumblr blog! blogged on my blog too! I mentioned the lookbook in my post today. so very beautiful. thank you! I posted on facebook! Love the watch!! I'm in love with the Lookbook!